Architectural treatises of the early and mid-sixteenth century reflect many of the central concerns of Renaissance humanists, including the importance of studying the original texts of classical authorities, of translating those texts into the vernacular, and of reinterpreting the classics for contemporary use. The authors and editors of architectural works in Renaissance France, not unlike the poets of the same era, sought to elevate their art above the level of a mechanical or manual craft, and required architects to be well versed in the Liberal Arts. Both theoretical and technical works on architecture of the era reflect the humanist view of man, created in God’s image, as the measure of all things. The Gordon Collection volumes in this category illustrate in various ways the fundamental notion of the human form as the guiding principle of order and beauty in architecture. The Roman architect, Vitruvius, described a man with arms and legs outstretched, whose body thus conforms to the geometry of a circle and of a square. 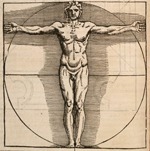 No illustration of this image has survived from antiquity, but the famous drawing of “Vitruvian man” by Leonardo DaVinci represented a popular illustration in Renaissance books on architecture. 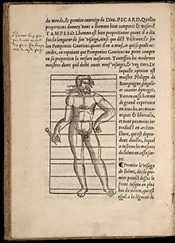 Woodcuts in the French edition of the Vitruvian treatise, prepared by Jean Martin, illustrate the human figure inside geometric forms, as in this image from page 56 of Gordon 1572 .V58. The theoretical treatises of the Renaissance are all based directly or indirectly on the classical manuscript of Vitruvius, the only complete Roman architectural treatise to survive from antiquity. The work was translated into many languages, circulating in manuscript form in the Middle Ages, and printed in numerous editions in the Renaissance, first in Italy, then in France and other European nations. Fifteenth and sixteenth-century translators and editors sought to integrate classical theories of architecture (the Orders, as defined by Vitruvius) with local design forms and building techniques. Writing in the vernacular, they sought to explain theory as well as to reveal methods and techniques that were previously transmitted orally within craft guilds.¹ Their works were of particular importance to those seeking to study the architectural heritage of Rome, for most of the buildings of the classical era had long ago disappeared or were in ruins. Vitruvius’s treaty includes a wealth of information and much theory, but there are naturally many topics and details not addressed, and those gaps fueled numerous subsequent expanded editions, treatises and debates in the fifteenth and sixteenth centuries, including texts in Latin and in Italian by Alberti, Serlio, Vignola and Palladio. The need for drawings, designs, examples and explanations caused Vitruvius’s text to be translated rapidly into many vernacular languages. 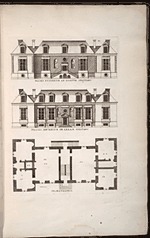 The works of architects and editors in France and Spain, such as Philibert de L’Orme, Jean Martin, Jacques Androuet du Cerceau, and Diego de Sagredo, tended to shift the focus to information of an increasingly practical nature, with more illustrated examples. Regional tastes were also accounted for in the selection and interpretation of classical models. The increasingly important Mannerist aesthetic in French art and architecture influenced the work of Jacques Androuet du Cerceau and Hugues Sambin during the latter half of the sixteenth century. ¹ See Vaughan Hart’s introduction to Paper Palaces, p. 6-8. (Full reference below). Guillaume, Jean, ed. Les traités d’architecture de la Renaissance. Paris : Picard : Publié avec l'aide du J. Paul Getty Trust, 1988. Hart, Vaughan, and Peter Hicks, eds. Paper Palaces: The Rise of the Renaissance Architectural Treatise. New Haven, CT: Yale UP , 1998. Pauwels, Yves. L’architecture au temps de la Pléiade. Paris: Gérard Monfort, 2002. Architectura: Architecture, Textes et Images XVIe - XVIIe siècles. Site created by the Centre d'Études Supérieures de la Renaissance, presenting high quality digital facsimiles and transcriptions of architectural treatises of the Renaissance, along with valuable commentary and bibliographies.